Overall the first half of the season started off very strong, but seemed to slow down towards the mid-season finale; although the teasers in the epilogue of the mid-season finale left us wanting more. Hopefully the writers and the show runners will keep us engaged with their serialized storytelling while adding on to the mythos. ComiConverse Contributor, Leonard Marciano, provides a full Gotham mid-season review, including recaps of what has happened so far and what to look for in the second half of Gotham's second season. The first half of the season was billed as the “Rise of the Villains." We were introduced early on to Theo Galavan, and there was wild speculation about who he become. However, it soon became clear that he was just another villain who added on to the mythos of Gotham’s rouge gallery. He did herald the birth of the Joker to a certain degree by introducing theatrics into Gotham by giving Jerome a platform to deliver his message of madness, and it spread like a disease to other “potential Jokers.” Although the show runners of Gotham left it vague as to whether the Joker entity was simply people’s psychosis getting the better of them, or if there was actually something metaphysical about him; they were able to maintain the integrity of the Joker’s origin being unknown. 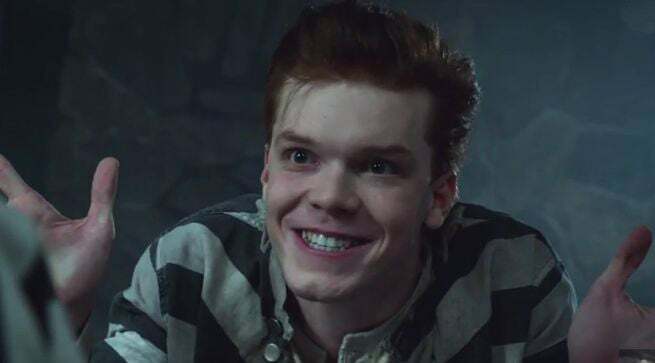 Some will criticize that the Joker is now just be a copycat of Jerome, but the ambiguity of that crazy strain was meant to depict the true chaos/order that the Joker brings to Gotham and the criminal underground. Now back to Theo Galavan. Although his demise came in the mid-season finale; one can’t help but wonder if the graphic nature of his death might have him returning as perhaps, Dr. Death. We also saw two more villains revealed in the final moments of the season finale in Mr. Freeze and Dr. Strange. For Mr. Freeze it will be interesting to see what kind of origin they give him since this will likely have an impact on his emotional heft in the show. As for Dr. Strange, we saw that he is running mad scientist type experiments under a secret division of Wayne Enterprise. For Dr. Strange we can only hope that he won’t be relegated to the role of a mad scientist, but rather grow into the true psychological menace from the comics. Now a quick review of the rest of our characters: Gordon appears to have a different origin in this telling, since he seems set to end up with Lee instead of Barbara. Traditional comic fans may complain about this outcome. However, we could consider this to be an alternate Earth as it will provide more flexibility for the overall story. This keeps the story fresh and allows us to truly expect the unexpected. Also, it is still too early to tell whether or not he will truly end up with Lee, or if, like Batman, Gotham and his job will always come first, ending his relationship with Lee. Bruce, on the other hand, is receiving an Earth One origin where Alfred handles the majority of his training. This seems more feasible as he as his guardian and the training gives him a medium to vent. We are seeing Bruce’s resilience and cunning in many of his endeavors, but it would be nice to see him train other skill sets and disciplines as the story progresses. It has been nice seeing Bruce extend his trusted inner circle to Lucius Fox as well. Penguin and Riddler have one of the meatier stories this season. Anytime Penguin is on the screen it is a treat. The audience ends up cheering in an Anakin Skywalker-esque way for him. Riddler, on the other hand, has become a serial killer, in his post-Hush storyline. The blend of goofiness and his ability to flip a switch and slit someones throat make for a very compelling character. The escalation progression we have seen with Nygma has had a good pace, and has always left the audience wanting more.